I was born and raised in Guatemala City, in Central America. Guatemala is called “el país de la eterna primavera”, which means: the country of eternal spring. I met my husband who was a US Marine in Guatemala. We got married, and a few weeks later we were stationed in Beaufort South Carolina. Just so you know, the humidity in Guatemala’s jungles, and rain forests do not compare in magnitude of misery to the one in the south. After 3 ½ years we were sent to Yuma Arizona. For the life of me, I thought I was never going to enjoy the outdoors, and believed the only way possible would to become nocturnal! However, “man is a creature of habit”. So, we had to adapt to our new environment, and as we did, we learned to appreciate our surroundings. A long, long, long 6 years later, we were transferred to Tucson. I couldn’t decide what was worse, the humidity of the south, the scorching heat of Yuma, or the brown lifeless landscapes of our new place. It is needless to say, we learned to embrace it. But, deep inside of me, I’ve always looked for a part of home in every place I lived. So, we met a fellow/co-worker/friend who loved plants. Being the child of a military family, he also moved quite often, and he was fascinated by the variety of roots, flowers, grasses, trees and many more species that grew in the south, and other parts of the globe. He also moved to Tucson with his family and made this mountainous town his own. As an adult he went to Jamaica, and he saw for the first time sugar cane stalks. He did what any custom agent at airports tells you not to do! He brought some home. However, the stalks did not make it due to the harsh winter. Fifteen or so years later, he visited some family in Florida. 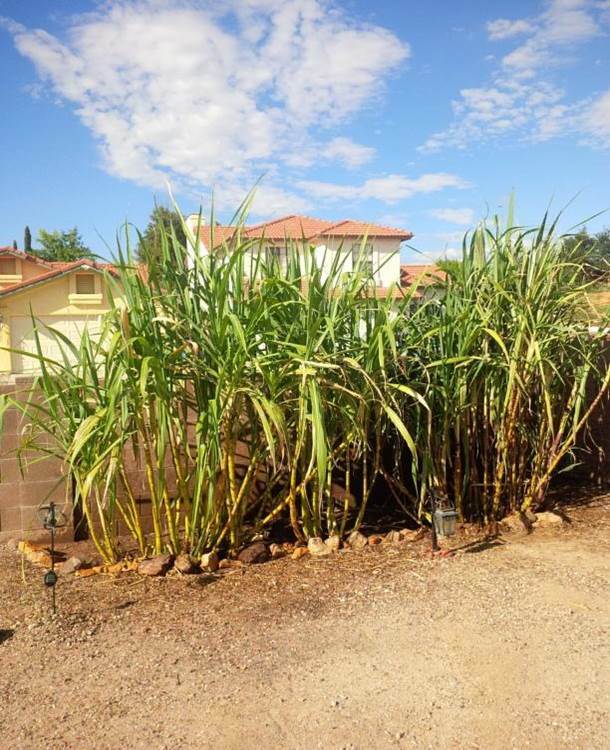 Amazingly, he found some sugar cane in the back of a relative’s property line. Of course, he returned to Tucson with some of it. This was a different species compared to the one he found before. The skin was a yellow-honey color as oppose to the purple one he had tried growing in the past. Fast forward to a trip to Cuba, he found the exact yellow-honey cane that was growing on the east coast of Florida. When the stalk gets tall it produces seeds, which he has never used. He simply cuts small chucks and puts them in the ground. They have little roots around the joints, and often times small bumps that actually materialize into fresh green shoots. Once the process starts with the pieces in the ground, within 5 days, positive growth is easily visible. Being a tropical plant, an abundance of sunshine is required, and of course here we don't have high humidity or rain, so to compensate for the dry conditions, water is given until monsoon season begins. All of his sugar cane is on the north side of his house against the wall. They get full exposure to the sun and no shade at all during the day. My family used to travel everywhere in the country, and in all the rest of Central American countries. 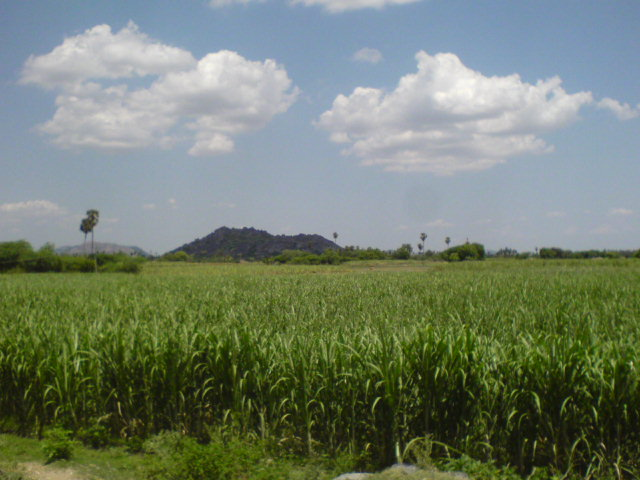 I used to eat sugar cane every time we traveled to small towns where it was cultivated. Therefore, I was excited to see this plant grow in our friend’s desolate backyard. 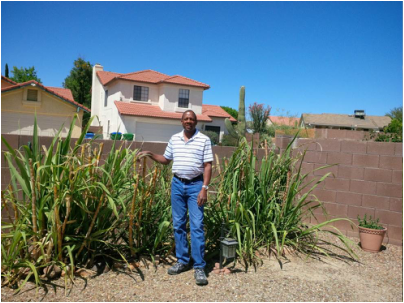 I am always trying to grow different types of plants, fruits, and vegetables in my backyard. I am not an expert when it comes to sugar cane, but I have decided to do an experiment by using young stalks in a pot. He has kindly donated some chunks to start my own sugar cane plantation. Needless to say, he has now so much sugar cane; he can probably open his own dishonest rum distillery and quit his job!